Home » #LadiesOfLondon » Annabelle Neilson’s Bravo Blog Creates A Rift Between The Model And Her #LadiesOfLondon Co-Stars…. Annabelle Neilson’s Bravo Blog Creates A Rift Between The Model And Her #LadiesOfLondon Co-Stars…. Something is awry in Twitterverse. 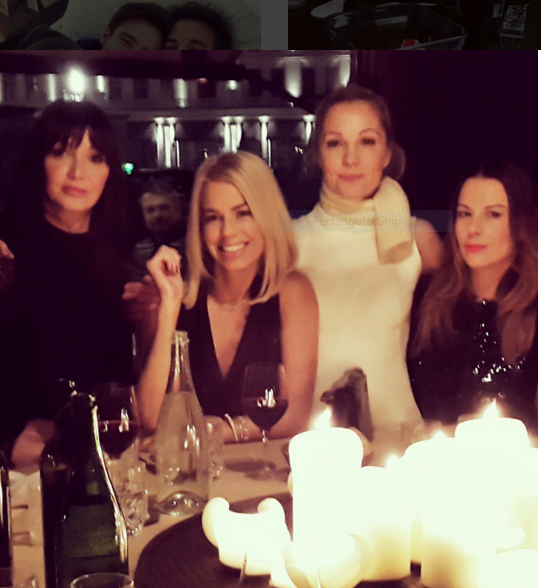 Annabelle Neilson is unhappy with co-stars Caroline Stanbury and former BFF Julie Montagu. On the most recent episode of Ladies of London, Monday night on BravoTV, there was tension brewing due to Nielson’s late arrival at Heathrow. Caroline Stanbury and Julie Montagu both made mention of her arrival time, worried if she was going to show up or not. In her blog posted October 26th Annabelle responds. Bravotv.com: What do you think about Caroline Stanbury’s comments about you arriving late? AN: What do I think of Caroline? If you do travel business class you should now you can arrive 45 mins before check in and 30 if you pre board…Oops, dig yourself out. Bravotv.com: Were you upset with Julie for not supporting you? How did you feel about your relationship at the time? Bravotv.com: What do you think about your honesty moment at dinner and what do you think of the ladies’ reactions? AN: I take loyalty and friendship seriously, bitchiness is not my style – it is done cowardly and with no respect. If you can’t say it to someone’s face don’t say it at all…By the way if anyone can give these girls a therapy session it’s me. And if Jules can have her bum out, then I can certainly have an opinion and say it to everyone’s face, not behind their backs. I don’t hide or tittle tattle or snipe, I say what I think like a real English lady, with style, confidence and mental agility something unfortunately rather lacking in present company. Maybe you should all take some English literature classes and then find some…I might be dyslexic but good breeding is a privilege not a disadvantage. What did Caroline say, you can smell a social climber a mile away…so true!!! Unfortunately the comments haven’t stopped with her blog. 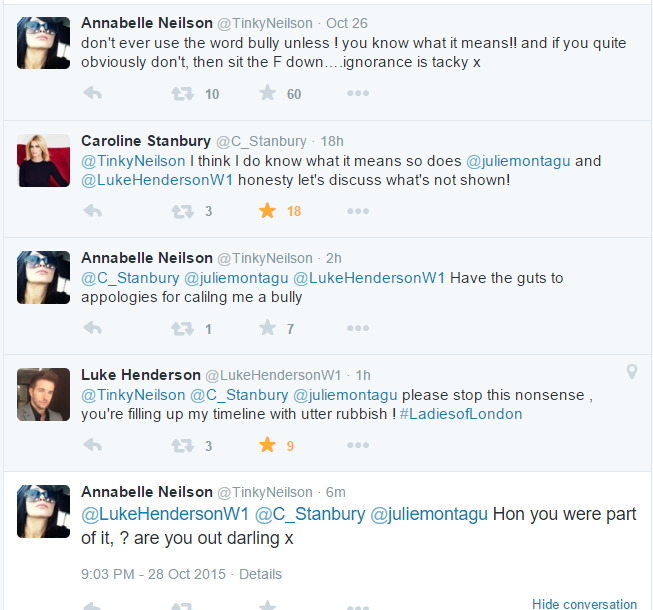 Annabelle has taken to Twitter tonight for a public exchange between her and co-stars Caroline Stanbury, Julie Montagu, and Luke Henderson. Montagu and Henderson have both tried to shut down the display. Followers on social media are urging the same. My advice? BravoTV needs to tape a Ladies Of London Reunion show so that all castmates have a chance to resolve any lingering issues with a moderator- Andy Cohen. I love this show and cast! Let’s hope cooler heads prevail and our favorite Brits can work things out soon! 5 Comments on Annabelle Neilson’s Bravo Blog Creates A Rift Between The Model And Her #LadiesOfLondon Co-Stars…. Wowsers. I think her being passive aggressive is kind of played. Good recap as usual!!!! Oh whoa, I missed all of this! Maybe Annabelle isn’t as boring as I thought she has to remember that Caroline is the 1 everyone wants to be like and liked by.